We’d love your help. Let us know what’s wrong with this preview of The Silver Mask by Christian Ellingsen. To ask other readers questions about The Silver Mask, please sign up. Rounding up from 4.5, solid book. Better review to come. Took way longer than I meant to get this up. 5/5 review for The Silver Mask! "As with the deaths of the gods and goddesses, it is unclear how Serindra died. It is simply known that one day the moon was whole and the next she had cracked and great tendrils reached out from her temporal form. In recent times, closer inspection with telescopic devices has shown these tendrils are made of the very rock that formed the body of the moon and may well be the rocky shooting stars that periodically crash to earth carrying the deadly quicksilver ore, cinnabar." I've come across this book a few times on reddit and in my goodreads feed, but never really felt the need to check it out, the incredibly dark cover just wasn't catching my attention. But I should've read this ages ago! The Silver Mask is engaging right from the start, throwing us into a story full of falling stars, murder, hidden cults and political intrigue. The gods are dead, have been for many, many years, and despite the broken land and terrifying monsters, mankind has thrived without them. But not everyone is happy and when a well loved woman named Vittoria ends up dead, Captain Fox must solve her murder before the town erupts into a politically charged catastrophe that can't be stopped. It has a Sherlock Holmes, Clive Clussler feel to it that makes it a fun read from start to finish. The awesome world building and creepy, mutated monsters were just as entertaining as the plot. "Ahead, standing on malformed legs, was a bear. The creature's paws were rending the flesh from a deer. A proboscis-like mouth was dripping black viscous fluid onto the deer's flesh causing it ti steam and reduce to a pulp. The thing dipped its proboscis into the pulp and suctioned the fluidic flesh." The only real complaint that I have with this one was that certain pages were hard to read. Scattered through out The Silver Mask are documents and letters that pertain to the murder mystery, and while I loved that they were there (and some of the writing was really pretty), I would've loved it even more if there had been an easier to read version in the back. Overall I felt like The Silver Mask was a really exciting read with great characters and I can't wait to see what Christian Ellingsen writes next. The mystery was fun, the world was interesting and the cult style religion just made the whole thing even better. What an utter marvel this is; I’m still in awe. I’ve read a lot of fantasy recently, a lot of it being through authors requesting reviews as Ellingsen has done here. The Silver Mask is utterly unique in its charm; not many fantasy novels feature murder mysteries alongside falling stars and terrifying hybrid creatures, yet here we are. There is something in this fantasy which doesn’t feel fantasy at all - it feels real, and this was Ellingsen’s triumph. His crafting of Vasini is stellar. Their pol What an utter marvel this is; I’m still in awe. His crafting of Vasini is stellar. Their political factions, their rebels, their elite, their peasants - all were given to us in a beautifully believable box, and I loved learning about this society. Ellingsen peppers the pages with letters, newspaper articles, and other documents to help us learn of Vasini’s history, and to help us understand the motivations of his characters. This felt very much like a ‘show don’t tell’ approach, which I’m always irrevocably on board with. My only complaint here is in relation to these documents. I was sent a digital copy, and most of the letters and articles are maddeningly difficult to read in this format, purely due to size. It would be helpful if they were enlarged slightly; this would have stopped the stares in public as I sat with my nose inches from my Kindle, reading the words aloud. Although there are worse sights on Glaswegian public transport; I have seen them personally. The plot is fast moving, engaging, and completely addictive. Ellingsen favours short, snappy, sectioned off chapters, flitting through locations and perspectives to give us a rounded view of what we’re dealing with. He organically brings characters together, raising tension, and making the story one which is absolutely impossible to tear yourself away from. The characters were gorgeous, raw, and magnificently flawed, yet slightly lacking in backstory. I’m torn with this thought as I’m unsure whether in-depth explorations of their pasts would have added to the plot, or have slowed it down and affected the deep engagement I had in the storyline. It’s also worthwhile remembering this is the first of a series, so perhaps deep dives into the characters’ past lives are still to come. Find this review at Forever Lost in Literature! I don't read many fantasy books where the main plot is kicked off by a murder mystery, so I was very intrigued to pick up Christian Ellingsen's flintlock and alchemy fantasy novel The Silver Mask. The first thing I want to mention about this book is how impressed I was with Ellingsen's worldbuilding. What particularly fascinated me was how carefully he shared the details about the world without ever giving too much information at one time. There aren Find this review at Forever Lost in Literature! The first thing I want to mention about this book is how impressed I was with Ellingsen's worldbuilding. What particularly fascinated me was how carefully he shared the details about the world without ever giving too much information at one time. There aren't any excessive areas of info dumping, as Ellingsen instead shares just enough information at each necessary moment to keep the reader engaged and understand what is going on. I've read and enjoyed my fair share of fantasy novels that don't give everything away at the beginning of the story and instead leave the reader trying to piece things out for themselves, so I felt that this worked really well in that vein. As more and more of the world is unveiled, I was excited by how rich and detailed it was, leaving me fully immersed and wondering what would be a part of this world next. Other aspects of the world-building that I particularly enjoyed were the cultural and religious components that really brought everything about the world together. Information regarding the gods and religion in this world were such a wonderful addition and really served to further expand the foundation of this book as well, and the best part was that everything felt so natural. There are a lot different characters whose POVs we switch between, and I was glad to discover that, for the most part, each one was very distinct from the other and allowed me to easily decipher between one another. Rather than switching POVs between a single character at a time, Ellingsen splits up his chapters and features multiple character in each one, which made it hard to keep up at first, but eventually I fell into the story and didn't mind it as much. Having distinct characters is always important, but due to the style of this story, it was especially important here. I do want to note that there are truly a lot of different POVs at times, including some that don't last long and others that do, so just be ready for that if you decide to pick this book up. Captain Marcus Fox and Sergeant Locke are two of the main characters we follow and proved to be a great pair of investigators. Fox's intelligence and dedication was apparent and well-executed, and I appreciated that he did seem to have caution regarding the various activities he undertook, as it showed some positive qualities in his character that allowed me to enjoy following him throughout the story. Much as Fox and Locke are investigating the murder from their side, Dr. Elizabeth Reid is also conducting her own investigation of the murder until her and Fox decide to begin investigating together. The interactions between the main characters were always entertaining and I enjoyed how Ellingsen executed the various relationship dynamics. The political components of this story are strong, and it's safe to say that this book focuses much more on the politics than it does on other elements. Personally, I'm all for some politics-heavy fantasy as long as its written in a lively and engaging manner, and I found that The Silver Mask excelled in this area. I thought the divide between the upper and lower classes was also really well written and another fascinating aspect to explore. A thoroughly entertaining read, The Silver Mask focuses on a distinctly Georgian fantasy world, with an interesting history and magic systems. I personally love my political schemes and conspiracies, so I was in my element with the plot. Some minor issues with how certain parts of the novel were laid out on my e-book version, but nothing that detracted hugely from my enjoyment. I would definitely pick up the next book in the series. The cover looks like a photograph of a museum piece. While accurate, I don't believe it's enough of a draw to pull in a reader. If this was non-fiction about said mask, maybe it would be sufficient. But even so, the lighting is too dim. The color chosen for the title font is muddled. It should stand out more, like the byline actually does. The typeface is fine. 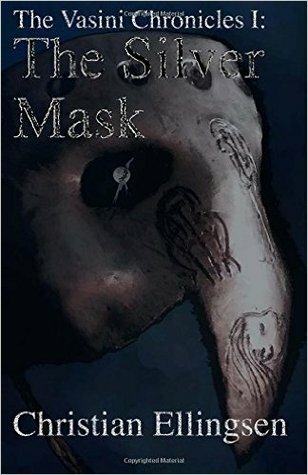 Still, there's so much going on in this novel that the cover should have been a scene from the book rather than the mask, which plays su The cover looks like a photograph of a museum piece. While accurate, I don't believe it's enough of a draw to pull in a reader. If this was non-fiction about said mask, maybe it would be sufficient. But even so, the lighting is too dim. The color chosen for the title font is muddled. It should stand out more, like the byline actually does. The typeface is fine. Still, there's so much going on in this novel that the cover should have been a scene from the book rather than the mask, which plays such a minor role in the book that I'm thinking the title should've been something else: City of the Dead Gods? Alchemy of Resurrection? The chapters are broken into scenes which are occurring simultaneously, rather than devoting a single chapter to a character and his/her POV. It was a little confusing and took a little bit to get used to it and the characters sorted out. However, the opening chapter gave me the impression that a lot was happening on several fronts and thus drew me in. After a while I was able to discern the personalities of the major characters and what roles they played in the city of Vasini. Ellingsen has invested a great deal of effort in developing the world wherein this story lies, but he doesn't drown you in backstory. It starts out with the familiarity of a mirror Earth and then the differences are sprinkled into the story. The culture of Vasini draws heavily upon the French—many French words frequent the manuscript—but there's a dead pantheon of gods that is complete fiction. There are sub-humans that live among the Vasinians as servants to the wealthy and strange monsters in the woods. And it rains all the time, which might be attributable to the heavily damaged moon in orbit. To help the reader become more familiar with the city of Vasini, its inhabitants, and surroundings, Ellingsen has placed images of random documents highlighting Vasini's religious, philosophical, and cultural history between chapters. When I could read them, they were a nice touch. Unfortunately, I don't know how to enlarge images embedded in books on my Kindle Fire (just the text) so some of them were illegible. Captain Fox and his assistant, Sergeant Locke, are the detectives charged with solving Emerson's murder. But as the investigation plays out, they discover that there is much more going on underneath the surface. Not only is Vasini a city that is divided between rich and poor, but the wealthy are bitterly divided into factions (Fishers and Scarlets) that manipulate the masses. Emerson's murder is the spark that sets off retaliatory assassinations on either side of the political divide. Reid and her friend, Catherine, are conducting their own investigation in parallel to Fox and Locke, for their own reasons. They're clearly in over their heads, and it isn't until Reid joins forces with Fox that they're able to see enough pieces of the puzzle to figure out how to solve it. Christian Ellingsen has created a rich world within The Silver Mask, and despite 400+ pages of exploration, I feel like he's just scratched the surface. He carefully juggles a large cast of characters with ease, and it shows when we're afforded time to read from so many unique points of view (some extensive, some just a pivotal moment). While the mystery seems so Byzantine that Fox and Reid always seem to be three steps behind the antagonists, it only makes the resolution that much more satisfying. 200 years after mankind rose up and destroyed the gods, civilisation has rebuilt itself and the city-state of Vasini stands proud in a world filled with twisted creatures that roam the wildlands. But the murder of a wealthy socialite leads Captain Fox of the city Inspectorate along a path that shows that the political divisions within the city may be leading to something far more dangerous. Once I got into it, I really enjoyed this book. The story is interesting and well thought out. Starting of 200 years after mankind rose up and destroyed the gods, civilisation has rebuilt itself and the city-state of Vasini stands proud in a world filled with twisted creatures that roam the wildlands. But the murder of a wealthy socialite leads Captain Fox of the city Inspectorate along a path that shows that the political divisions within the city may be leading to something far more dangerous. Once I got into it, I really enjoyed this book. The story is interesting and well thought out. Starting off ostensively as a murder mystery, the array of characters thread their way around the plot, slowly coming together as their aims converge. I was impressed at how well Ellingsen manages the different characters, each with their own motivations and needs, as there were a lot to deal with. The world creation is expertly done, deftly giving us enough of the world to facilitate the story and the characters whilst hinting at there being more out there that we have yet to see. The politics and world of the city of Vasini were developed enough to give us a view of what was going on without being heavy handed. To be honest, I get nervous whenever I see that an author's debut novel is numbered, especially in fantasy. Too often it leads to a book where the world itself was far more important to the writer than either character or story. Ellingsen happy manages to avoid this, giving us a glimpse into what the reader can feel is a much larger world with a lot more to explore outside of this particular story. My only real issues with the novel came with the pacing at the start and the very end. Ellingsen introduces a lot of characters at the start of the story and then swaps between them scene by scene rather than chapter by chapter. I did actually really like the effect this gave - that of a huge city with so much going on that was bigger than any single character - but it did make it hard to grasp who was who for the first act. I would have liked a little more focus on one or two characters at the start, establishing who were the main protagonists. This would have given something a little stronger to grasp onto while I got my head into the world and the story. By the second act, as the characters begin to come together and the different threads weave together, this becomes far less of an issue. I just have to admit it took me a little while to settle in and feel comfortable I knew exactly which of the many scenes held the main characters and plotline. Likewise, the ending fell a little flat for me. I don't want to give any impression it wasn't a good ending, far from it. Ellingsen's story is interesting, and he's a good enough writer that we're kept guessing right up to the very end as to what's actually happening. It's just that the climax seemed to be missing some... oomph. This might well just be my own tastes, however. I can't quite put my finger on what's missing, but I think it's a hangover of such a rich preceding story. After a book with so many different characters and plots, reaching the end where we finally bring everything together seemed a little empty to me. While Ellingsen does well to keep the story focused through the characters, here I would personally liked a little more spectacle. Although this is a long novel, and wordy in places, I really enjoyed it. A cracking story with excellent characters. The only downside for me was the small text and I didn't care for the block paragraphing. Also the italic paragraphs. The words seemed to bleed into one another. Otherwise, an enjoyable read. I received this copy as a Goodreads Giveaway. Thank you. Christian Ellingsen grew up first near treacle mines in Hampshire and then in the depths of the South Wales valleys. He attended the University of Wales, Lampeter, and Cardiff University, graduating with a BA in History & English and a MA in Creative Writing. After several jobs in community regeneration in one of the most deprived areas in Wales, he worked for the BBC, first on the Switchover H Christian Ellingsen grew up first near treacle mines in Hampshire and then in the depths of the South Wales valleys. He attended the University of Wales, Lampeter, and Cardiff University, graduating with a BA in History & English and a MA in Creative Writing. After several jobs in community regeneration in one of the most deprived areas in Wales, he worked for the BBC, first on the Switchover Help Scheme and then in Radio Drama.